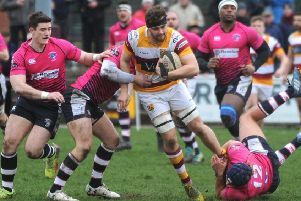 Fylde’s hopes of a third consecutive victory at Brantingham Park were dashed as they lost 33-14 at Hull Ionians. Once again, the visitors found themselves significantly in arrears at 18-0 down after 37 minutes. They came back and reduced the deficit to four points before Ionians’ pragmatic tactics won the day with two tries in the last 10 minutes. Nevertheless, Fylde remain at the bottom of National One after a seventh defeat of the season. Ionians started the game with intensity as Isaac Green landed two penalties in kicking his side to a 6-0 lead. He missed another attempt on the quarter-hour but, after an evenly-contested 15 minutes, Ionians extended their lead. Joe Allott benefited from a fortunate bounce to score his side’s first try on 32 minutes, Green adding the conversion. They followed it up four minutes later when Tom Rees scored a fine individual try as Hull led 18-0. It looked as though Fylde would end the half without scoring after being ‘nilled’ last week against Coventry. However, late pressure resulted in Dave Fairbrother driving over for a good try. Fly-half Greg Smith kicked the conversion and, at half-time, Fylde trailed 18-7. Nine minutes into the second half and Fylde were right back in the contest when Tom Grimes scored a neat try, with Smith adding the extras to make it 18-14. However, Ionians registered the decisive score at the start of the final quarter when Green slipped over for a try after a driving lineout. Trailing 23-14, Fylde brought on Adam Joyner and Tom Burtonwood for Mark Irving and Ben Gregory. As the pressure on the visitors increased, Henry Hadfield was sinbinned in the 69th minute. Ionians kicked for the corner from the penalty and used their extra man to smuggle James Sanderson over from a driving maul. Fylde’s heads didn’t drop and they continued to play their attacking game but, as they pressed they left themselves exposed, and Ben Bell drove over to ensure a rather flattering 33-14 win.